Prime Minister Nuri al-Maliki has agreed to leave office. 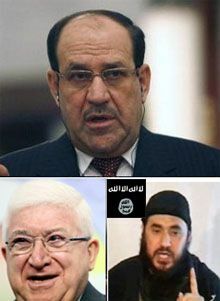 Maliki ended eight years of often divisive, sectarian rule and endorsed fellow Shi'ite Haider al-Abadi in a televised speech during which he stood next to his successor. Earlier, a leading figure in the Sunni minority told Reuters he had been promised U.S. help to fight the Islamic State militants. Ahmed Khalaf al-Dulaimi, the Governor of the Anbar province, told Reuters that the U.S. promised air support for its fight against militants. "Our first goal is the air support. Their technology capability will offer a lot of intelligence information and monitoring of the desert and many things which we are in need of. "No date was decided but it will be very soon and there will be a presence for the Americans in the western area." Kerry said Maliki’s actions could lead the U.S. to withhold further military assistance just days after American jets and drones began launching air strikes against Islamic State positions in northern Iraq.